Detta är vinnaren i Svenska Hembryggareföreningens sommarölsprovning i Göteborg 2006. 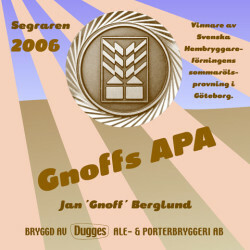 Receptet är gjort av Jan "Gnoff" Berglund. small bottle at woodshop. Very interesting beer. Big head on this amber pour. Aromas were a bit tart and fruit, but the flavor was more sweet and touches of fruity hops. Pours a golden orange with a tight bubbled, cream colored head that took more room in the glass than the liquid. It took 5 minutes to die down, and then the horse blanket and hop nose came through. The flavor to me was like fresh Orval in a way. Quite complex and interesting. Bottle from chris cquioroga at woodshop quad. The label was taped on and it was labeled on the cap that he traded this with ompher in 05. Pours reddish/orange with a big huge foamy head. Nose is sweet and funked out. Taste is sweet prickly on the tongue and overall not bad. Had this from tank at the brewery, draught at The Rover and Bishops Arms in Göteborg as well as at GW68 in Stockholm. The beer was brewed according to my recepie, but I had no commercial interests in it. Have been thinking about whether or not to rate it, but here goes. Clear amber color, fluffy off-white head. Citrus and grape scent, hoppy and sweet. Grape, citrus hoppy taste, also sweet. Smooth nice mouthfeel, medium bitterness. Bottle. Hazy amber colour with a white fizzy head, too carbonated. Fruity aroma with hints of hops. Light flavour of caramel and hops. Ends up with a bitter and butterish finish. Bottle. A hazy amber beer with a off-white head. The aroma is floral, hoppy and fruity. The taste is floral, hoppy, caramel malt and fruits. Medium body with a dry finish. Handbottled. An unclear amber beer with a thin beige head. The aroma is sweet and very hoppy giving it notes of grass and citrus. The flavor is sweet malty with notes of citrus, grass, and some dill, leading to a dry bitter finish. UPDATED: FEB 17, 2008 From 33 cL handbottle. Pours amber and hazy with a creamy white head. Malty, and light metallic and mild fruity aroma. Grapefruity aroma. Carbonated. Fruity and bitter aroma. Bottle. Huge fizzy beige head that mostly lasted. Good lacework. Light cloudy amber color. Caramel, grain, floral, grass, grapefruit, citrus and a hint of spice. Medium bodied with a dry and alcoholic texture and extremely fizzy carbonation. Light sweet flavor with moderated bitterness. Way to carbonated to the point of spoiling the fun. Bitter finish.